theory among the media and the public that a cover-up was orchestrated to protect one or more of the Skakel children involved in the murder of Martha Moxley. Within this speculative paradigm, Littleton is usually delegated as the knowing witness and subject of a major pay-off. Dominick Dunne's best-selling novel, A Season in Purgatory, based loosely on the Moxley murder, tells the story of a young man who witnesses his best friend commit a brutal murder and whose silence is subsequently purchased by that friend's wealthy, somewhat Machiavellian father. The inconsistencies between fact and fiction are too numerous to mention, but the core element of someone outside the family, like Littleton, living with a scandalous secret, is very much a widely-held suspicion in this case. It is also a possibility, however fantastic, we will not dismiss out of hand. Even if the theory has no merit at all, it seems, at the very least, as though Littleton occasionally aims to imply that such a scenario may have occurred. Why he does this cannot easily be determined. Again, it is difficult to sift through the real and the paranoid when listening to the voice of Ken Littleton. We must remember, he is a man with a genetic and socio-cultural predisposition to bipolar mood disorder stemming from stressful occurrences, from which he now suffers. He is also a serious alcoholic, allegedly "recovering" through the assistance of twelve-step programs. We must consider that Littleton may be a guilty man, haunted by his actions, who seeks for the sake of self-interest to protect himself by throwing speculation towards others. For all his problems and pitiable weaknesses, he is still an intelligent and potentially conniving convicted felon who has failed two lie-detector tests regarding the murder of Martha Moxley. We must also consider that Littleton may be a completely innocent man, merely haunted by the specter of suspicion. It is possible, as Littleton insists, that the stress of being suspected and questioned during the investigation caused him to fall into depression and deviant behavior. Again, he has been clinically diagnosed as having both a genetic and socio-cultural predisposition to such a reaction. In the course of our investigation, we have also found indications that the Greenwich Police Department has been over-zealous, and occasionally reckless, in their campaign to incriminate Ken Littleton. In the wake of their efforts, many allegations and innuendos about Littleton's character and subsequent conduct were divulged and promoted. Some of these we have found to be largely without merit. Others remain uncertain. Some have made their way into the media. Later in this section, we will look closer at these imputations and their significance. Finally, we must consider that Littleton may be innocent of Martha's murder but guilty of not disclosing pertinent information--whether to protect her murderer(s) or not. It is clear, at the very least, that Littleton has held back. 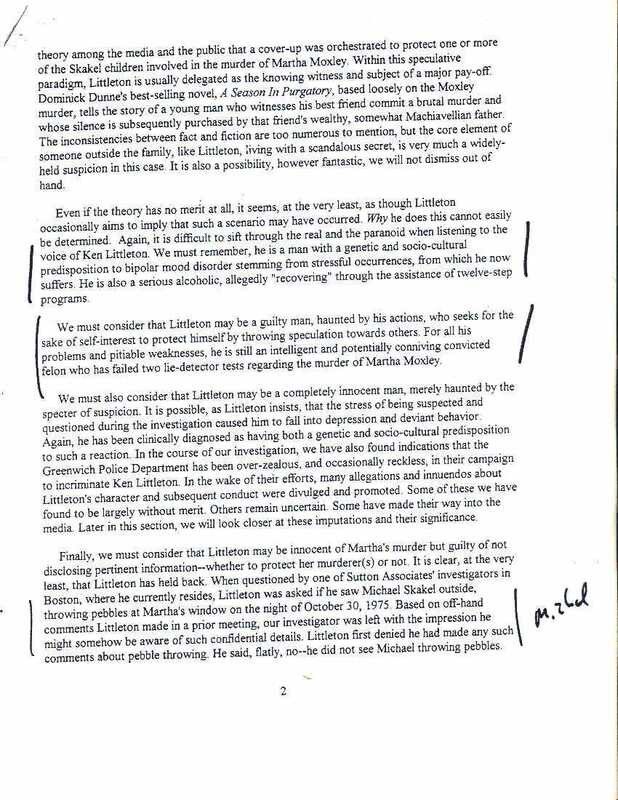 When questioned by one of Sutton Associates' investigators in Boston, where he currently resides, Littleton was asked is he saw Michael Skakel outside, throwing pebbles at Martha's window on the night of October 30, 1975. Based on off-hand comments Littleton made in a prior meeting, our investigator was left with the impression he might somehow be aware of such confidential details. Littleton first denied he had made any such comments about pebble-throwing. He said, flatly, no--he did not see Michael throwing pebbles.